We have 2 instructors in your area! Alan recently moved in to the area and is now a great addition to the team as a Driving Instructor in Upton and the surrounding areas. He is now providing driving lessons in Upton and all around after spending 20 years educating road users in the various areas of London. With driving lessons in Poole and Bournemouth providing a different challenge to that of London, Alan is looking forward to using his enthusiastic, easy-going and very knowledgeable style to help his pupils to become thinking drivers. As with all YES! instructors, Alan is of the belief that no two traffic situations are the same and also that no two pupils are the same. In order to turn all pupils into ‘thinking’ drivers, Alan encourages his pupils of all standards to evaluate their actions and work out how to deal with any situations in the safest way possible. Some pupils require a set of rules or procedures whilst others enjoy a more free flowing style of learning. No matter to Alan, he makes all learning styles look easy and relaxed in the car. After spending some time of his life outdoors gardening, Steve decided on a career change towards driver education 6 years ago. Always eager to improve, he now also provides trailer training throughout Dorset (B+E), in his powerful Volvo XC90. He also covers learner drivers in his Ford Fiesta. Steve is very laid back and always willing to go the extra mile. This brings him into the odd Dorset Village. He also appreciates that some people are only free on a weekend. You might easily see him on the way to a lesson on a quiet Sunday morning. It is said that he just loves to teach but we are not entirely sure about his claim to do lessons on Christmas Day though – maybe if you ask him really nicely :)? Steve is keen to see his pupils progress in a relaxed atmosphere. He likes to challenge his pupils but never pushing beyond their capabilities. Steve ensures that his pupils move on at a comfortable pace. Whilst carrying out Trailer training, he will first assess your driving skills and advise you on any improvements. He will then move onto the Trailer training. As you’d expect of a YES! Instructor, Steve is well educated, knows how to drive a train, holds a degree qualification, has taken his HGV licence and is often taking part in CPD, such as teaching learners with special needs etc. Some say he resembles Bruce Willis, so here you go, can’t go much wrong! What do you think? Be nice though! You can learn to drive in Wareham with YES! Driving School, be it in a manual or trailer (B+E) lessons! Our reliable, patient and friendly instructors cover all areas of Wareham, including Slepe, Bere Regis, Wool and the surrounding area. With YES! you can have your driving lessons in Wareham with peace of mind knowing you are with a fully qualified, DVSA approved & DIA registered driving instructor. We welcome anxious and nervous pupils and our experienced instructors will transform you overtime into a safe and confident driver! How do I book my driving lessons in Wareham? How much will a Driving Course in Wareham cost? 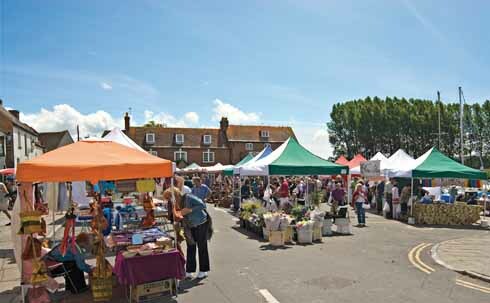 Going by the name of Wareham Town, this historic market town is situated on the River Frome about 9 miles from Poole. With many attractions ranging from Wareham Forest to Dorset Downs and from Corfe Castle to the preserved Swanage Steam Railway, Wareham and the surrounding area is an interesting and picturesque place to learn to drive. Book Now to secure your driving future with YES! Driving School.